Tillamook Country Smoker is one of those brands that seems to get Googled a lot, at least by analyzing my website stats anyways. While I don't have the answers why, I tend to think it's because the name "Tillamook" may conjure up images of gourmet food, and people often remember a time when they could get gourmet jerky along with their Tillamook cheese. But Tillamook Country Smoker is not the same company as Tillamook County Creamery. It's the Creamery that people think of when they think of cheese. At one time, the Creamery used to sell jerky from the Smoker, and even included it in their catalogs. And that's where the confusion started. 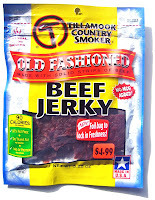 Eventually the Creamery stopped selling the jerky, and then sued the Smoker to stop using the name "Tillamook". But in the end, the Smoker won the right to keep its name. Today, the jerky remains a very popular brand in the Pacific Northwest, filling up store shelves in many of the major chains. I don't particularly see it in stores here in Southern California. And that's too bad; I've tried all of their varieties, and found them all to be very snackable. Beef, brown sugar, water, salt, corn syrup solids, maltodextrin, black pepper, garlic powder, vinegar, sodium erythorbate, citric acid, sodium nitrite. The tastes I pick up off the surface of these pieces is some sweetness and a slight smoky flavor. In the chewing, I can pick up some salt flavor, some black pepper taste, and some hints of garlic. I can also detect a bit of natural meat flavors. 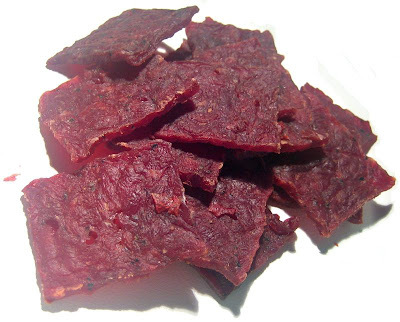 It's a very flavorful jerky, having a good deal of flavor intensity, and a fair amount of flavor complexity with its combination of sweet, salty, pepper, and garlic taste. I'd say that the bulk of that flavor intensity is a pretty even balance between the sweet, salty, and black pepper tastes. That makes up the dominant flavor of this jerky. The garlic is noticeable, but not as strong as the other tastes. The natural meat flavors are faintly recognizable. I think that's only because in this original variety, there's less flavor competition compared to other varieties. If you recall, in my review of Tillamook's Chili Pepper & Lime variety, I noted there were no natural meat flavors, and probably because the other flavors crowded it out. The level of saltiness is not too bad here. It doesn't taste too salty, but probably at the upper level of what I'd normally find comfortable. If I just evaluate it on a single piece, it's perfect. These are slices of whole meat, sliced to an average thickness, and in square pieces of about 1 inch by 1 1/2 inches. It's somewhat of a dry jerky, with a good deal of flexibility. It's fairly easy to tear a piece apart, with perhaps a bit of effort. The meat is kinda chewy, and may also take a bit of extra jaw effort. Over the course of a 3.25 ounce bag, you'll burn some calories working your mandibles. The meat texture provides some of the steak-like chewing character, but not totally. There's a slight rubbery nature to it where the piece tends to bend and compress, and then reassume it original form in the first few chews. But it breaks down easily enough, and chews more like meat. It's a very clean jerky, leaving very little residue on my fingers, and no tiny fragments on my lap or desk. If anything there's a fine waxy feel that remains on my fingers. I don't find any pieces of fat on this jerky, no tendon and no cartilage. I paid $4.99 for this 3.25 ounce bag at a Thriftway grocery store in Renton, WA. That works out to a price of $1.54 per ounce, putting this into the average price range. For general jerky snacking purposes, at this price, it's presents a good value. It has a good taste, has lots of flavor, a fair amount of flavor complexity, and a decent meat consistency. I find myself wanting more and more of it. In truth, I actually found myself on the border between average and good, but eventually fell towards the average side. This is actually a very good snacking jerky, with a good taste, and a fair amount of flavor complexity for your brain to appreciate. 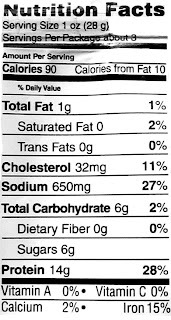 But I tried to find a reason why this jerky is above average, and I didn't feel it was truly above average. It's just a very good average jerky. Perhaps a little more of the natural meat flavors could have pushed it higher, or even a better meat consistency. The Chili Pepper & Lime variety that I reviewed earlier has a better taste, and got a better rating. I've tried other varieties which I also felt had great flavor. 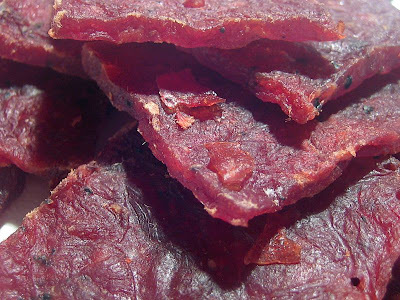 It's still a great jerky for snacking. If you want a beer with it, I'd recommend an Irish red. I bought some and infact am eating it. Your review is spot on, and the pepper only comes out when you chew, which I like. It's a very good "average" jerky. It has just the right amount of spice and makes me want to keep eating. I HATE this jerky. I just bought some this weekend to try and it was not even close to good. I bought the Brown Sugar and Honey kind and it didn't taste anything like brown sugar or honey. It was VERY peppery and if I wanted that much pepper I would have bought the PEPPERED beef jerky flavor! Also, it was extremely difficult to tear and chew. You are better off buying the cheap Wal*Mart brand. It's easy to tear, soft and very flavorful. I don't usually buy off brand, but in this case, it is the way to go. I just tried some of this jerky today in the "Old-Fashioned" variety, and there is waaaaay too much pepper for my tastes as well. My mouth is still burning from it. If I would not have seen the package I would have bet money I was eating the "Peppered" variety. I won't buy it again. The chunks vs strips are awesome. I'd like to see a review of that try to call them "average." I grew up with this brand and it used to be much better. It was more like homemade, long pieces and much thicker. You kind of had to pull or tear a piece off. The stuff they sell these days has been tenderized and the texture is very different. Even tastes different. Not as bad as the stuff they sell at Costco these days, but not allot better.